UNIVERSAL DESIGN: Full-motion wall mount for 37" - 70" flat-panel TVs up to 132lbs, VESA(mounting hole pattern) - compatible faceplate fits VESA 200X100mm (8"x4") 200X200mm(8"x8") 300X200mm (12"x8") 300X300mm (12"x12") 400X300mm (16"x12") 400X400mm (16"x16") 600X400mm (24"x16"), wall mounting studs distance up to 16" only. SAFE TO USE: Rest assured that your TV is in safe hands. 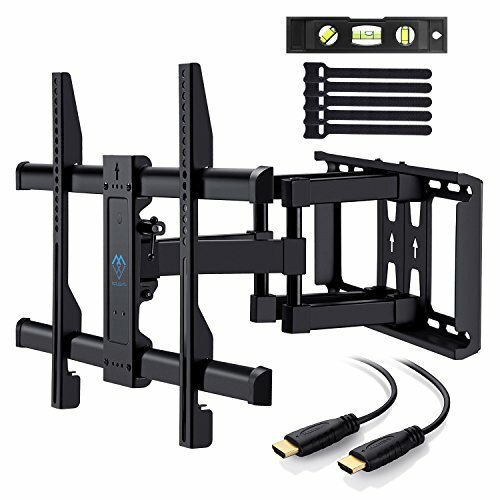 This heavy-gauge TV mount has high standards, holding 37" - 70" TVs weighing up to 132lbs, which are tested to hold 4 times the weight they're rated to based on UL standard. SAVE SPACE: Dual Articulating arms that retract 2.8" from the wall in home position to save space and also extend to a maximum 16" from the wall. Therefore saving you some valuable space and adding a nice, neat appearance to your household.